Kale the superfood that has taken over salads across the country is now taking over our skincare. With it's status as the food du jour it's not surprise that it's found it's way into Nip+Fab's new Kale Fix Skincare range. There are three products currently in the nourishing line which are packed with Kale and Watercress to reinvigorate the skin. I've had an opportunity to test before they hit Superdrug stores, although you can buy them direct from Nip+Fab now. 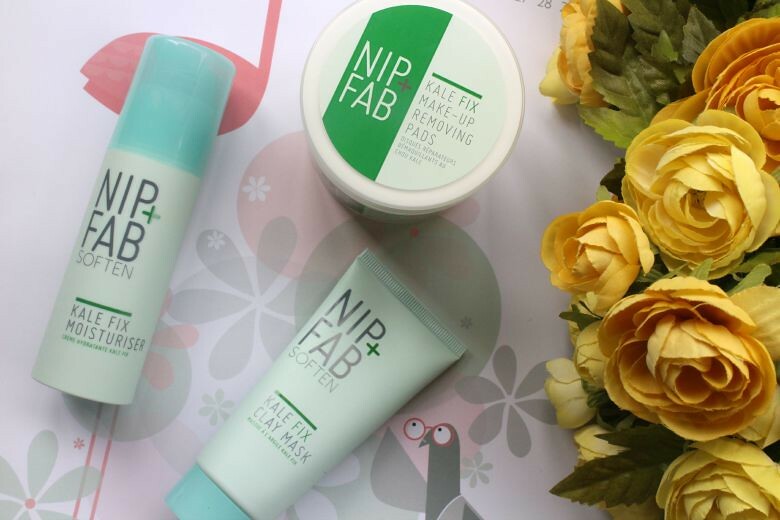 First up we have the Nip+Fab Kale Fix Make Up Removing Pads* which put simply are to gently cleanse dry skin. It's claimed make up will be removed and skin reinvigorated with Vitamins A, C and K protecting against damage. Of course as a 'beauty blogger' I should claim that no matter how sozzled I am when I crash in late at night I reach for the flannel and dutifully double cleanse but that would be a lie. As bad as it is it's considered a win if I even reach for the micellar water/wipes. I do like to have a stash of wipes or similar for these 'emergencies' and was keen to see whether the Kale Fix Make Up Removing Pads would do the job. Unfortunately for me they're just too small to do the job of a thorough cleanse. If you're wearing particularly heavy eye make up with liner and mascara I think you'd use at least two for that job alone. At £13 I could go through a significant portion of these pads just removing one face of make up - and that could get costly. Size issues aside I didn't find the pads drying, even less so than micellar waters and some cleansers I tried and they did not cause any sensitivity in the eye area. Where I found these cleansing pads to work was in the mornings when I was short for time. Overslept? A quick swipe with these does the trick with the fresh and to me cucumber-esq scent was pleasant for the morning and has made a nice change from the usual florals and citruses. I'm no gym bunny but I can also see the value of these for throwing into a gym bag if you need to freshen up between visits. Of course if you're something of a minimal make up wearer and or reserve these for times you're in a pinch I'm sure they will earn a place in your stash. Mine sit in my bedside table to be reached for whilst half asleep. Next up we have the Nip+Fab Kale Fix Moisturiser* which is priced at £20 and comes in a pump bottle. I appreciate we're supposed to only be interested in the product itself but I do like not having to scoop cream from a tub. Again the same scent from the cleansing pads is evident and makes for a nice garden fresh morning moisturiser. Aimed towards dry skin it's perfect as we start to enter the cooler temperatures and the heating is whacked up and our our skin begins to suffer. Thankfully the Kale Fix Moisturiser has all those nice ingredients to protect against these elements and others such as aloe vera and shea butter to help improve your skin texture and long lasting hydration. As you would expect from a moisturiser for dry skin it is what I'll, probably unhelpfully refer to a as a thin thick texture. By that I mean it's thick enough to put a layer of protection on the skin but thin enough to not feel like it's heavy and it's certainly not greasy. Overall it has been a nice addition to my morning skincare routine and make up sits nicely on top. Finally we have the Nip+Fab Kale Fix Clay Mask* enriched with minerals and witch hazel working to draw away impurities without drying the skin. At £13 this is a pricey mask but it's a good one. If you follow me on Snapchat (user name Florence and Mary) you might have seen me modelling it, during and after and my skin was certainly left with a glow. I did wake up in the morning with a spot or two brewing but that of course is the danger with masks but that makes for a good product instantly drawing our impurities. It's a white clay and not too messy which is always a big thing for me as I'm not a fan of the whole applying face mask process. Whilst the mask was on you could obviously feel it dry but not so tight it was uncomfortable. After removing my skin didn't suffer any drying and I was able to watch some of Big Brother before the adverts when I went to carry on with my skincare regime. If you're interested in trying the Kale Fix range you can pick up a bundle of all three items for £35 instead of the individual combined price of £46.